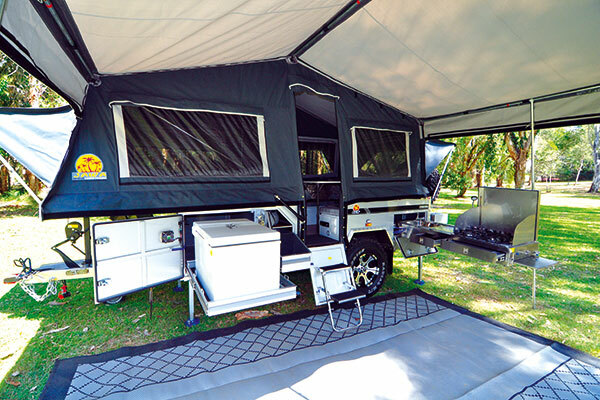 The forward fold market is hot to trot, particularly in southern Queensland, where a number of competitors are continually driving to provide the highest possible quality with the most fittings and accessories, innovative design and overall appeal at the lowest price. Bring on the Jawa Cruiser! The Cruiser is a slightly lower weight and spec’d unit with tremendous appeal and a load of capability. It’s a sensible package that’s capable of some radical offroad antics, and then provides the comforts of home for the family. 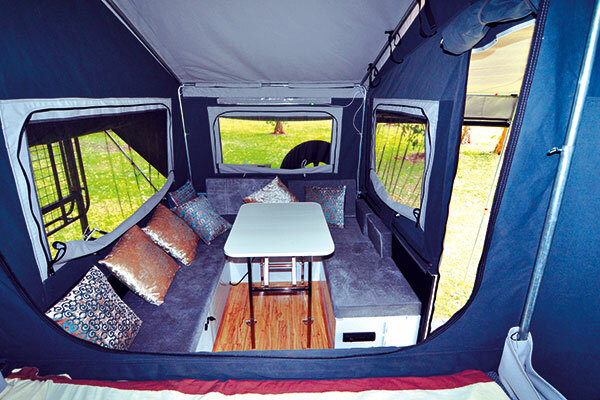 The crew at Jawa has learned plenty over their decade in the camper business, and has built a strong position with a large and varied range of campers including their new Trax 12 and 15 Hybrids. 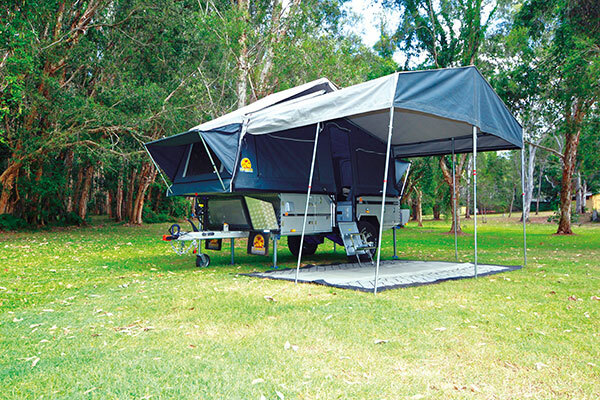 However, there is still strong attraction to the forward fold campers, which remain the highest selling configuration in Australia. The Cruiser comes in at a size and price that is attractive to entry level campers and dedicated offroad experts alike. It has slightly smaller dimensions compared to its larger stablemate the Outlander. The tare weight is 1390kg with only 90kg ball and an ATM of 1990kg that still allows plenty of loading weight for all of those camping essentials, including a full fridge! It is a forward folding operation with an overall length of 5200mm, is 1880 wide and stands 1520 high on its heavy duty independent coil spring suspension, with double shock absorbers either side allowing excellent ground clearance for the rough stuff. The Jawa Outlander has 12” electric brakes and adjustable camber plus the entire undersides including the chassis and Zincanneal tub are treated with a protective body deadener. It’s sure-footed ability tracks on 265/75/16” mud terrain tyres with attractive 16” alloy mags blend really well with a deep tub that is finished in a hardy, silver baked enamel paint. Out front the 100 x 50 x 4mm fully-welded box section drawbar peaks with an ADR approved 2000kg polyblock coupling, grab bar, a decent handbrake, premium Ark jockey wheel, Anderson plug, and a nifty stone screen with a replaceable mesh centre and checker plate wings protecting the jerry can and gas bottle racks. The main chassis is a sturdy, fully-welded box section construction that is hot dipped galvanised after manufacturing for longevity and there’s little to obstruct or catch underneath. 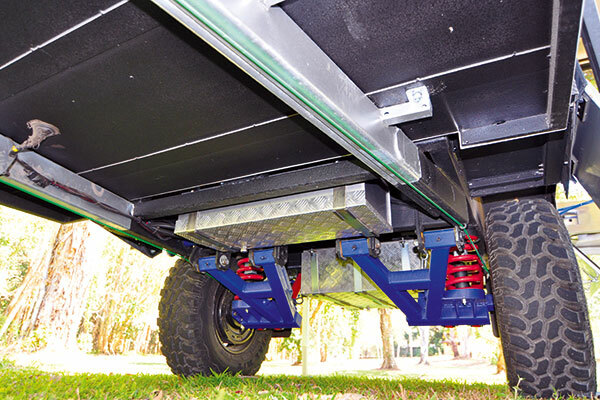 Set high into the frame are 120 and 35 litre stainless water tanks with checker plate bash guards and the entire underside floor and chassis is treated with a protective deadener to reduce wear through the continual sand and rock blasting from both on and off-road environments. Also underneath are twin recovery points at the rear, four retractable stabilisers and Jawa embossed mud flaps, front and rear, with their tropical company logo enticing you to relax under a palm tree! The large main body of the Cruiser is well-constructed and, quite frankly, very attractive. I like the colour selection with the silver paint highlighted by checker plate edge trims and two-tone canvas. The internals are fresh and clean with white steel cabinetry for strength and attractive longevity, offset by hard wearing faux timber vinyl flooring and plenty of large windows with inner and outer awnings as well as fine mesh flyscreens. At the rear is a very practical half boot where the annexe poles are stored, allowing extra room in the main tub particularly around the pantry. It also has a mounting point for the spare wheel plus a handy tool box for quick access to off-road necessities such as your recovery gear. Assembly is a minimal affair, with the forward fold assisted by a manual front and rear winch, plus properly weighted gas struts. I’m not keen on the fix mounted winch on the back corner where it will get knocked or grab a passing branch. It’s a simple matter to fix, simply use a detachable handle. I timed the boys setting up the Cruiser and it was a grand total of six minutes for an overnighter, plus quite an easy annexe construction should you want it. The annexe roof and some bedding can stay connected greatly reducing set up time. The 5m x 1.75 metre 16 oz main tent popped up in no time with minimal adjustment for tension. This is certainly a premium quality tent with its automatic erecting tropical roof, double stitching, both inner and outer awnings with easy set up poles, YKK zips and heavily reinforced on all wearpoints. 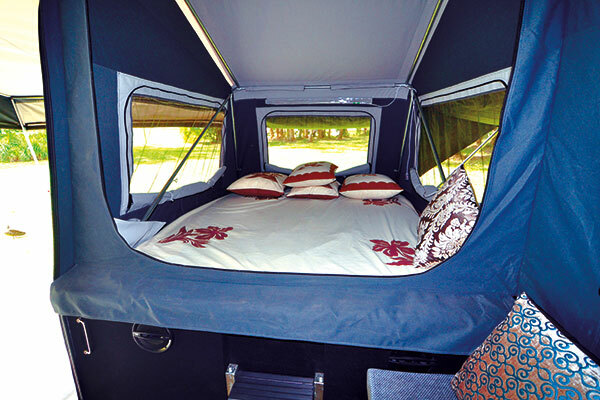 The tent also features the al fresco, café style opening on the living side plus a cabin divider for privacy in the forward queen bed enclosure. Inside we find the traditional forward fold layout with a U-shaped convertible dinette and drop down table that doubles as the infill for a second double bed. There are ample, thickly cushioned seat swabs that fall together as the mattress, and they are neatly trimmed in a grey velour type cloth. There is storage under all of the bench seats and adjustable strip lighting, 12 volt and USB points throughout. One of the main differences to the Outlander is that the full-steel interior only has a step under the bed, not the cabinetry of the stablemate. However it does add more storage room to the external pantry. Just inside the folding doorway/stairwell is a full CD/MP3/USB Bluetooth sound system with two speakers, plus the light and power switches making night time access easy and convenient. We set up the 5 x 2.4 metre annexe in a jiffy. You do need a separate ladder to insert the spreader poles but the outside frame was strong enough without. The annexe has a longer drop on the wall returns for added shelter from that harsh Queensland sun but it also means it’s easier to assemble the detachable walls. The Cruiser package comes complete with removable walls, floor and draft skirt for a longer stay. Jawa have taken particular care with dust and water ingress protection fitting high quality automotive seals and compression locks to all of their external doors and hatches. Its layout and standard facilities are very easy to live with providing the necessities of water, cooking, cool storage and electrical power in sensible supply. 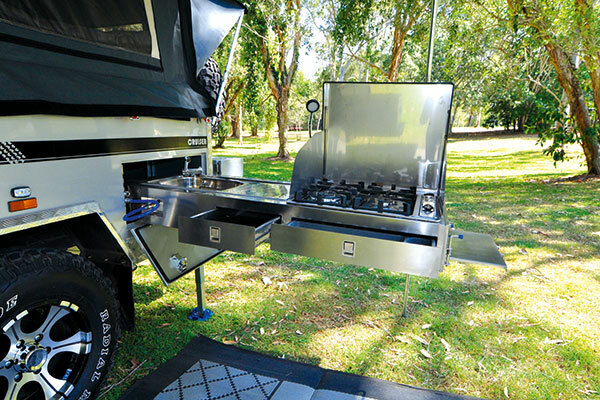 The Cruiser has a slide out stainless steel kitchen with extended preparation bench incorporating a cutlery drawer with liner, four-burner gas stove with three-sided wind deflector and sink with pressurized cold water, all contained in an easy pull-out assembly at the rear of the kerb/living side. Up front is a sliding fridge tray that is suitable for the largest portable fridge/freezers that tracks easily on slides. Next to the entry is a pantry drawer with storage above. It’s not huge but is accessible and acceptable. Around the drivers/road side we have a large storage opposite the fridge up front, more storage reflecting the pantry and then the electrical control box next to the wheel arch. All of the front hatches feature sensor style LED lighting to ease the night time fumbles. The fused switch panel manages the 2 x 100 AMP deep cycle batteries with digital volt meter, 240 volt battery charger, and the unit can also be charged via optional solar panels or the towing vehicle via the front 50 AMP Anderson plug. It has an isolator/circuit breaker, LED power and water indicators all in the lockable panel. There’s also a further small lockable safe at the rear plus the water fillers. Our demonstration unit was from the “Silver Series” which adds around $2700.00 worth of extras for a discounted rate of $2K, all up. It has a side folding boat/luggage rack, stainless steel kitchen drying rack/shelf, 200KWT portable solar panels, as well as a portable gas hot water system. Simply add a separate shower tent and porta potti and you have a very complete package, with hot water to sink and shower. There’s a long list of additional options to allow you to customize the unit, however the chosen specification presents terrific value at an advertised price of only $21,999.00 with the Silver Series package, or even cheaper with the standard forward fold model at only $19,990.00. In case you were wondering on the name, 'Jawa,' it is fashioned from owners, the enthusiastic and charismatic Jay and Wayne Hinchsliff who just ooze Queensland appeal in their larger-than-life personas. They took us on a tour of creeks, and coastal scrub to show off what the Cruiser is really capable of, and we all came out with big smiles all around. 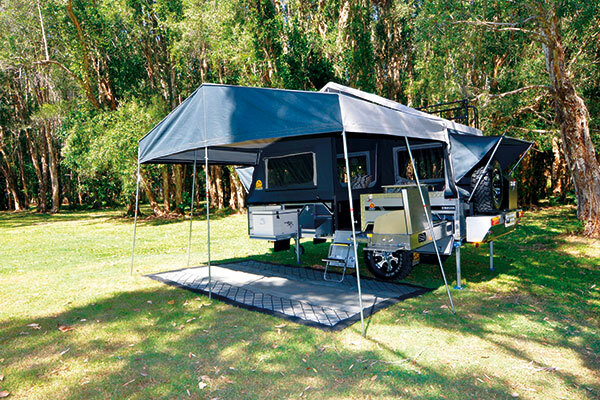 The Jawa Cruiser is a tuff, go anywhere camper trailer with the ever popular forward fold configuration giving plenty of living amenity for the whole family. It presents terrific manufacturing skills with high quality materials including the 16 oz canvas and strong support frame; plus it has a terrific assembly of standard and optional components in a great looking off-road machine. Nice one Jawa!